The Palestine Engineers Association (PEA), in partnership with the Federation of Arab Engineers, are due to hold the first international, peer-reviewed and multi-disciplinary event on climate change in Palestine, which is scheduled to take place in Al Bireh, in May. This international event comes within the framework of the PEA plan towards the development of the engineering work with interesting themes, locally and internationally, through the organization of international conferences dealing with the most prominent issues and challenges facing Palestinian society. The conference will provide a platform for sharing the cutting-edge research on climate change and global warming and their impacts on Palestine, Middle East and the whole world. The conference will be a real international gathering that brings together leading scientists, researchers, decision makers, governmental agencies and social movements to present research and experience related to climate change, in addition to discussing related strategies, policies and actions required for reducing greenhouse emissions and assessing developments in adaptation and mitigation technologies. PEA chairman, Eng . Majdi Alsaleh, in an interview with the Palestine News Network, described the conference as a ‘national duty’ of the association, since it is the largest professional association in Palestine. 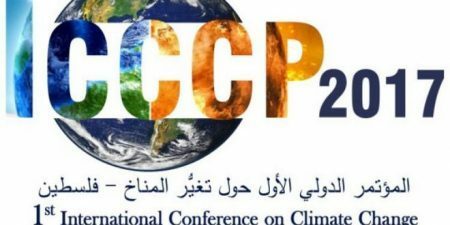 Alsaleh also stressed that the issue of climate change is very important to the Palestinian people and their future generations, especially since the Palestinian leadership is moving towards signing the Paris Agreement on Climate Change, as a member of the UNFCC. Alsaleh explained that the Israeli occupation played a major role in restricting Palestinian adaptive capacities and ability for implementing mitigation plans. Financial support, technology transfer and capacity building, in addition, are vital issues for achieving the mentioned goals in tackling, mitigating and adapting to climate change. Therefore, obtaining this will include political guidelines as well, since the occupation not only restricts lives of people but also the environment. The chairman finally called on all specialists and researchers to support this conference, and to be present, since it will enrich their knowledge in the field of environment and will come up with recommendations for the Palestinian government.